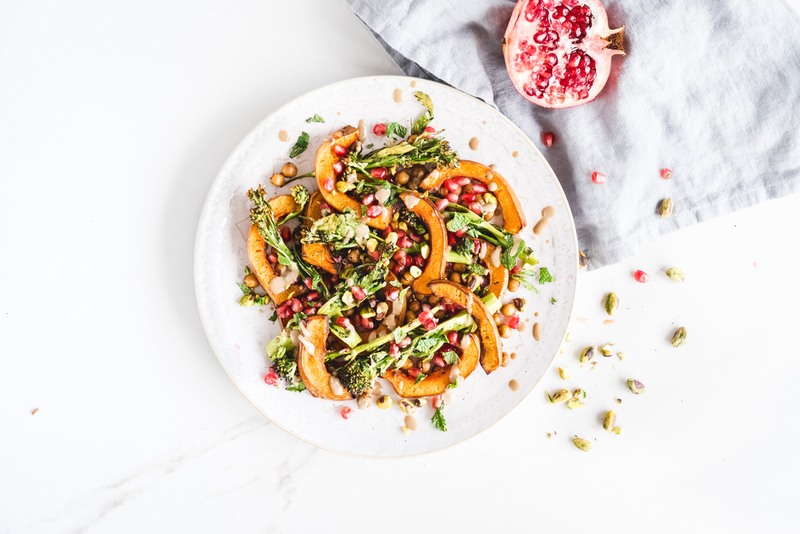 Persian squash with pomegranate and pistachios. Monday night just got faaaaancy! Catching up with friends recently, we were intrigued to hear they have made their lives a fraction less hectic by signing up to a recipe box delivery service. According to my husband all we eat is Thai green curry, chips and bits or “anything with nutritional yeast chucked on top” so clearly this vegan chef needs to expand the repertoire. Plus, I am tired. I am busy. The service sounded tantalising. Less thinking. More variety. Less waste. Fewer chips. Mindful Chef is currently the only recipe box delivery service offering plant based options. At £7 per person per meal, it was more than we’d usually pay per meal from a supermarket, but did I mention how tired and busy I am? And I mentioned my husband’s nooch comment, yes? The box of tricks arrives. Inside the box, four bags of goodies. 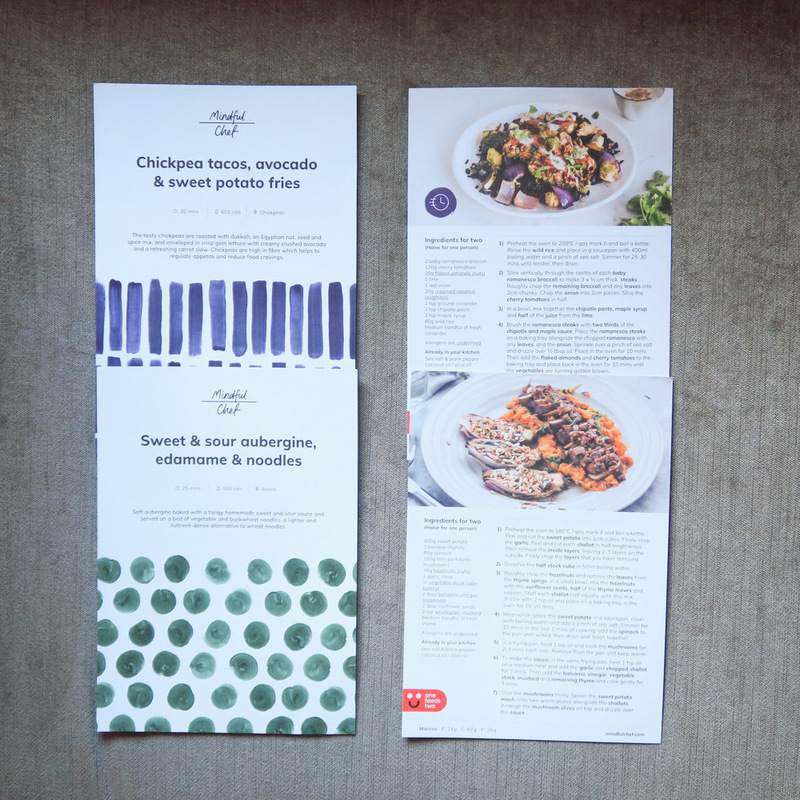 Recipe cards are colour coded with the bags for ease of reference. Box One arrived and we opted for Mexican pinto beans and salsa stuffed avocado for our inaugural dinner. It did not look like there was enough for us greedy guzzlers so I threw some safety sausages in the oven. We buy our sausages from Hooba and they’re fricking delicious, fyi. The recipe was a doddle. “What a flavour combination!” said he of nooch remarks. Even without safety-sausages we’d have been satisfied. 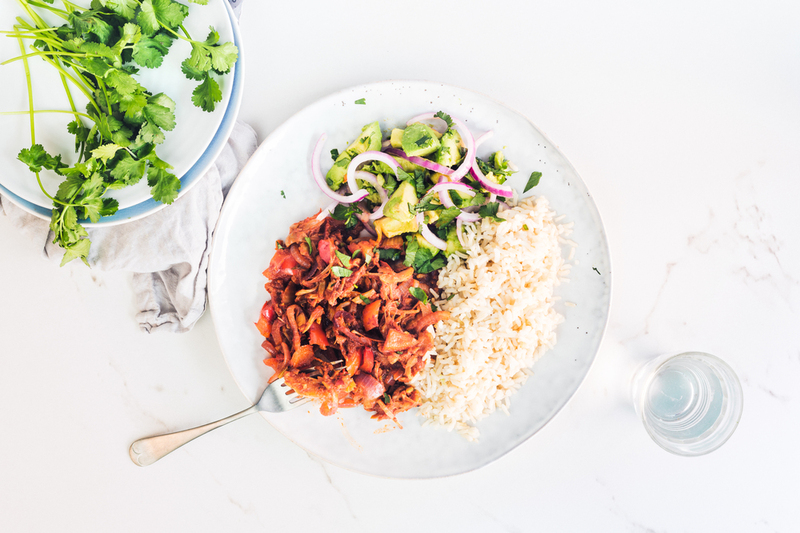 Pulled barbecue jackfruit with brown rice and avo salsa. Day Two: Miso aubergine buddha bowl with raw carrot strips and tamari nuts - ten points for bringing miso into my life, goddamn that stuff is moreish! A za’atar cauliflower, artichoke and parsley dish was extraordinary and our fave yet, but lettuce-boat tacos were fiddly. But if everything’s on a Richter scale where one is Kim’s Thai green curry, (rushed, bland, boring, repetitive) and ten is an earthquake of innovative flavours, snazzy ingredients, foolproof recipes and Instagram-friendly presentation (vital) these meals are all an eleven, even the lettuce boats. But week two’s delivery was insulated in sheep’s wool. So in a moment of defiance, I quit. I did it for Ewe! The automated message asked why I was leaving. It’s too expensive, I moaned. Vegan boxes shouldn’t cost as much as meat boxes. Discount for vegans! Also, wool! Squash mushroom and butter bean 'lasagne' (minus the starchy carbs) OH GOD I MISS YOU SO MUCH ALREADY. It was an inspiring fortnight and I hoped I wouldn’t fall straight back to rotating Thai green curry and chips and bits. I do own about 57 vegan cookbooks so come on Willis, ready, steady, cook! But in the weeks that followed, we discovered that my uncle Bruce Willis was right. Old habits do die hard. ‘I miss Mindful Chef,’ Gaz said forlornly as he pushed some chips around a plate so sad it cried vinegar tears. I missed MC too. If only I hadn’t sent that aggressive email. Once you realise that with four MC meals, you’re less inclined to blow just as much money in one night going out for dinner, you actually save dosh. Plus you’re not buying any more ingredients than you need for each specific meal. No leftovers, no waste, no bottles of sherry languishing in the cupboard because of that one time you needed a splash. He’s right. I buy all the ingredients for something fancy then see if I can make Thai green curry out of what I bought. Every time. Sweet potato and ginger rostis with greens - but I could probably fashion a Thai green cuz out of it. I wrote to Mindful Chef, sheepishly (how apt) asking if they’d have us back. But could they please not deliver our meals in insulation made from animals. The lovely customer service adviser assured me there must have been a mistake. Ordinarily vegan boxes would never be insulated with wool. AND! Taking on board what I and no doubt other v-gang customers had pointed out about the pricing structure, 2018 began with a price reduction for all plant based legends. Our meals now start at £5. A vegan victory! What I've really grown to love about MC is that they're friendly, responsive and adaptive. They hear what their customers say and they listen. The exact opposite of how I feel after three hours on the phone to a BT call centre. AND! Another new policy implemented this year means you can send the packaging back. So I keep my ice packs and once a month, send them back to MC to mindfully reuse. AND! They have introduced jackfruit and other fancy plant based ingredients. AND! They don’t like starchy carbs, so pasta and the like are vetoed and instead we get innovative alternatives that make me go Oo! I never thought of that! AND! We often get complimentary presents, like a carton of coconut water or protein balls. I love freebies! Tandoori tofu and chickpea pancakes. Dinner has never tasted so good. Let me titillate your tastebuds. We’ve devoured gnocchi with truffled mushrooms and broccoli, baby pumpkin stuffed with spiced lentils, Tandoori tofu and chickpea pancakes, sweetcorn and leek fritters with avocado, Brazilian black bean stew. All outside the comfort zone, all delicious, all filling. And even though it initially seemed more expensive, we’re saving money. I was a fool to leave you, MC, promise me you’ll feed us forever. Note. Mindful chef delivers up to four meals on a Monday. Come the weekend, you will be required to engage your decision making process, open your cookbooks, buy your own ingredients, make your own damn dinner. So there’s still room for chips and bits. Not a Thai green curry in sight. Although if there was one, MC would ace it. This is not a sponsored post, but Mindful Chef did lend me the food photos because we eat at night and can't do the food justice in artificial light!